One of the many aspects of film is the ability to challenge the idea of what is reality. It isn’t so much that a film takes you away from reality as much as it alters your reality. That’s why films like Jaws, Ex Machina, or 2001: A Space Odyssey work so effectively well: they make you think beyond your boundaries, altering your perception of reality. Sadrac Gonzalez’s Black Hollow Cage offers a similar mind-altering experience. Julian Nicholson plays Adam. He lives with his daughter, Alice (Lowena McDonell) in a secluded house, away from the remainder of society. Alice’s other companion is a dog, Beatrice (voiced by Lucy Tillett). The story does not share why they are isolated and the only outside world contact is a doctor at the beginning of the film, played by Daniel M. Jacobs. Early in the story, Alice finds a cubic device in the middle of the forest. Its exterior is smooth, with no reflective or refractive surfaces, yet it reacts when she touches it. It behaves as the Monolith did in Kubrick’s 2001: A Space Odyssey. 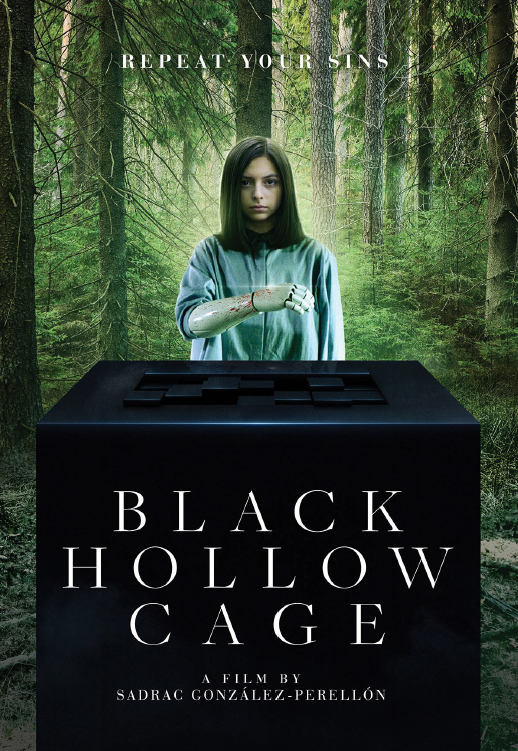 The film does not focus on the cube, though it drives the events that follow as Adam encounters Erika (Haydee Lysander) and Paul (Marc Puiggener). Alice does not trust either of them, while Adam remains compassionate. As Mr. Gonzalez’s script unfolds, I couldn’t help but think about some of the more powerful films I’ve seen in the past few years that dealt with seclusion, specifically. Columbus came to mind for its aesthetics while Ex Machina comes to mind for certain character aspects that Mr. Gonzalez’s story shares. Mr. Gonzalez attempts to take elements from each of those films. One of the most striking aspects of this film is its look. Ivan Romero, who did the majority of the camera work and served as the film’s director of photography, had his work cut out for him. Form, color and light are the most important aspects to the look and design and they shine. Perhaps it is because Mr. Gonzalez focused on the look and design, the story suffered. Although the progression of the story makes sense, the characters felt as austere as the cube that is at the center of the story. There is plenty of emotion, but a significant amount is Alice and Adam screaming at each other, though Adam remains remarkably calm throughout the ordeals. For such a serene film, there is a significant amount of violence as well. Within the opening moments of the film, there is a violent attack, which should set the tone of the film, but it doesn’t succeed. In another instance, when we first meet Erika and Paul, Erika has been physically attacked. There are a number of other instances where violence is a factor in the story. None of it is overdone. If anything, a lot of it reminded me of The Shining. The violence along with the outbursts of emotion are a product of the isolation, yet Mr. Gonzalez’s story does not bring them full circle. The design and cinematography should have completed the circle, but there is a disconnect between the two.